Fellow co-anchor Chuck Scarborough who has been by her side at the newsdesk from the time she has been on WNBC, narrated a tribute to Sue Simmons. Many of her previous colleagues spoke fondly of Simmons. Including former Live at Five co-anchors Jack Cafferty and Matt Lauer. Al Roker had a few nice words as well. After the montage Sue almost freaked out the newsroom by saying "Shut the front door!". Referring to the time she had said "What the Fxxx are you doing?" during a previous promo for 11pm newscast back in 2008. To which she later said "Almost got you, didn't I?" 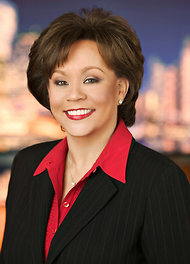 Sue Simmons will be missed at anchor's desk. But as she says she is not leaving the news. And is hoping to find work elsewhere. "Even if it's just once a week" according to her.